The leaves are falling, but our spirits are rising!!! With the bad weather kicking it, it becomes difficult sometimes to keep our spirits high. It is a scientific fact that bad weather and no sunlight brings on bad attitudes and overall negative energy in the workplace and at home. Sunlight produces Vitamin D in the human body when the light hits are skin. Vitamin D is essential to the well being of all of us. Google it!!! It's amazing how one little chemical can have such a profound affect on our behavior and health. We find that there are plenty of activities we can do as a team (at Seven Feathers RV Resort) to keep our attitudes positive and our spirits high! My personal favorite thing that we do as a team to boost moral and attitude is having a company meal together. Every now and then, everyone will throw in a little bit of money and we get some food for all of the employees. Either we get things to cook a meal, or we order take-out from one of the local businesses. There is nothing that lifts morale and promotes positive attitudes more than a belly full of awesome food, right?!?! It sounds so simple and obvious but not a lot of employers do this now a days. Another thing that works amazingly well for a morale boost is a good old fashioned team building session. What I mean by that is having a meeting with the whole crew and enjoying some fun games and activities to stimulate team work while having a good time. For example, we will all split into groups and draw what we think our company mission or goal is. 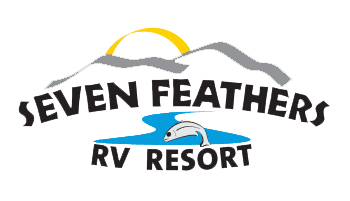 We put this into a visual representation and draw what turned out to be, some pretty great examples of what we think Seven Feathers RV Resort stands for and is all about. These group sessions can have an affect on the employees attitudes that is paramount to the success of the company as a whole.